Dress just like Jessica Alba in these dark floral Current/Elliot Jeans. While the style star paired her's with a bright blue tank, there's no reason you can't cuddle up in a cozy gray or burgundy knit and an adorable loafer. Forget the conventional cutesy flower print, this deep neutral jungle pant makes it that much easier to pair with fall's favorite hues like green, brown, and blue. Pick a printed pant that plays with some of fall's most popular colors, like purple and green, and pair it with a matching accessory. Since the pattern is pretty busy, you'll want to keep the top neutral. But don't worry, you can pick up the color again with either a purple flat or colorful structured satchel. 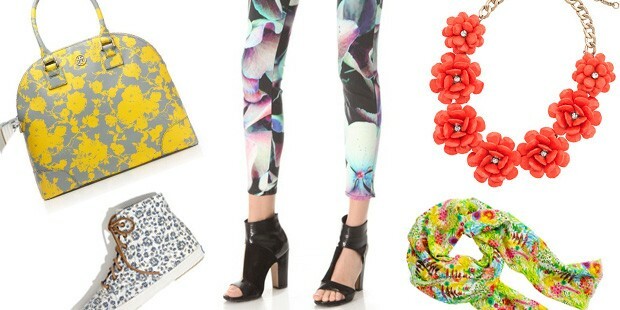 Instead of a jean or silky trouser, try a twill pant, like this bold floral Sparkle & Fade pair. Make sure to keep your shirt neutral, you want to let those big buds shine! Floral pants were a huge hit this past spring and summer. With Miranda Kerr stepping out in pair last month, and Jessica Alba spotted in Current/Elliot floral skinnies multiple times the past few weeks, we have a feeling this celeb fave is here to stay. And just because they&apos;re floral, doesn&apos;t mean they don&apos;t work for fall! Since this week is the last real week of summer, and we all have fall fashion on the brain, we&apos;ve rounded up the ten best floral pants, tailor-made to help you transition between seasons.